It is a good practice to clean out your e-mail folders occasionally. This reduces the overhead on both your PC and the E-Mail system and may speed up the process of accessing your e-mail by limiting the number of items that need to be loaded when you access your account. Since each item takes up space in your mailbox; removing some will also free up more space for new messages. Messages in your Inbox; Sent Items and other folders can be deleted when they are no longer needed or when there are too many to keep track of. Merely click the unwanted messages to select them and click the 'Delete' button denoted with an ‘X’. This will move your messages into the 'Deleted Items' folder to give you a chance to be sure before removing them for good. You can then empty the 'Deleted Items' folder by choosing 'Empty Deleted Items Folder' on the 'Tools' menu or by right-clicking on the 'Deleted Items' folder itself and choosing 'Empty Deleted Items Folder' on the menu that appears. Your 'Junk E-mail' folder can be emptied occasionally by right-clicking on it and choosing 'Empty Junk E-Mail Folder' from the menu that appears. Junk E-mail items will not be moved to the 'Deleted Items' folder. They will be deleted instantly. 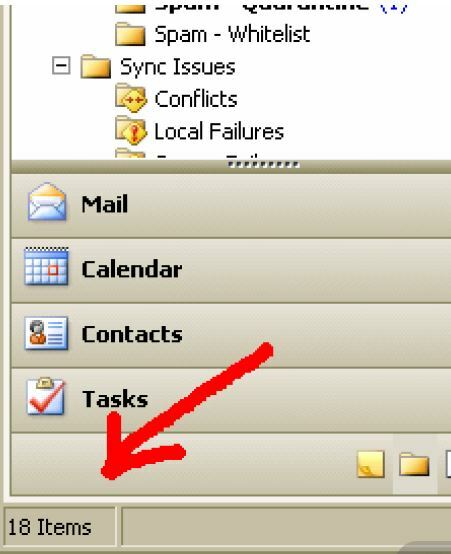 For folders that do not have an automatic “Empty” option like the “Deleted Items” and “Junk E-Mail” folders it may be cumbersome to try to delete messages one at a time. It may sometimes be necessary to remove large amounts of messages to clear up space in your account. This can be done very quickly by using the shift-click technique in which you click the first message to be removed and then hold down your “shift” key while clicking a message further down in the list. This will select all of the messages between the top message and the bottom message. The whole group can then be deleted as one batch. Remember; your computer and the e-mail server have to process each message you delete so it is usually good to limit the number of items you delete at one time to a few hundred so that you don’t tax your computer. If you try to delete several thousand messages at one time your computer may seem to slow down while the items are being processed and may become unresponsive. You can see the number of mail messages a folder contains by clicking the folder in your “Folder List” and then looking in the lower left corner of the program window. If a folder contains 1000 messages and you want to remove them all; but would like to do it in smaller groups to avoid bogging down your PC; you could click the first message; then scroll half way down the list and shift-click a message to select approximately 500 messages. You could then delete the 500 selected messages. The remaining 500 messages could be removed by clicking the top message; shift-clicking the bottom message and clicking the “Delete” button. Remember to empty the “Deleted Items” folder when you are sure it is safe to permanently delete the messages. It may be advisable to first sort messages by date (They are generally in this order to begin with.) and then try to delete all messages older than a certain date using the shift-click technique. It may be good to only keep the last several months worth of messages. Since a date and time are listed on each message; you can sort them by date to easily remove old messages. If your message list is not already in chronological order; you can click the column header labeled “Received” to sort them. Clicking several times will put them in reverse order. Once messages are sorted by date; it is easy to use shift-click to select messages of a specific age to be deleted as a batch. Again; be sure to empty the “Deleted Items” folder to permanently remove deleted messages.